If you are looking to sell your home, RE/MAX Coast and Country understands the power of creative, well-organized and highly effective marketing and offers customized marketing plans that maximize property exposure to the most qualified & discerning buyers on a “nationwide” and “global” level with the backing of a leading Real Estate Company such as RE/MAX. As an Internet professional, they use up-to-date technology to promote your home. In today’s market, 60-70% of buyers will visit the Internet first before looking to buy. This translates to maximum exposure worldwide to getting your property sold quickly. Contact RE/MAX Coast and Country directly at 541-412-9535 or 541-40-REMAX (Brookings office) and 541-412-3000 or 541-69-REMAX (Harbor office) to obtain maximum exposure on the process of selling your home. Accurate evaluation – The current selling price of a home is the highest price that the market will bear. To assist you in determining the correct asking price, we can provide you with a market analysis of comparable properties sold and offered for sale in your neighborhood. Professional advice – We will advise you how you may best prepare your home for showing. You will be kept up-to-date on the state of the market, the sale of similar properties, and any other factors which may affect the progress of the sale. Availability – We make ourselvesf available for your questions and concerns. Our direct phone numbers, 541-412-9535 or 541-40-REMAX (Brookings office) and 541-412-3000 or 541-69-REMAX (Harbor office), is accessible, 7 days a week. The major selling points of your home will be distributed to other real estate firms throughout the community. Personal contact will be made with agents active in the area. Signage – The highly respected RE/MAX Coast and Country lawn sign advertises your property 24 hours a day, along with Global Internet Exposure through RE/MAX International. Open houses – If appropriate, open houses will be arranged and held during reasonable hours. Advertising – we will promote your home on the Multiple Listing Service, GLOBAL exposure by RE/MAX International Advertising as well as many NATIONWIDE Real Estate Websites known for its successes, our very own website, in our local newspaper and through print advertising in appropriate publications, reaching locally and beyond. 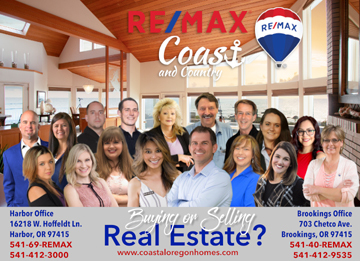 RE/MAX Coast and Country offers a virtual marketing plan, which may include featuring your home on virtual tours, digital photos. Progress report – our personal attention to consistent communications with you will keep you up you date on every step in the sales effort. Offer presentation – When we bring offers for your consideration, we will inform you of the pros and cons of the offer so that you will have all the facts to make a decision that is right for you.